Many of us, when we juggle bills, contemplate a car that needs replacing, work in a job that is often tedious or boring, imagine what it would be like if we could turn what we love doing into a career that would bring us fame and fortune. How grand it would be to be a master gardener who wins huge prizes, or a virtuoso musician who plays in concert halls all over the world. We assume that 'success' will bring us happiness, but what if success and happiness do not necessarily go together? One day a young bear cub finds a strange object standing in a clearing in the forest. It is made of wood and there are black and white keys running down the length of it. The cub touches the keys with his paws and makes a dreadful sound. The little bear leaves, but he comes back the next day, and the next. For weeks, months, and years the bear comes to tap the black and white keys every day. By the time he is a grown up grizzly, the bear can make beautiful music when he plays the piano, for that is what the object in the forest is. The bear goes to the city and it isn’t long before he is the toast of the town. Everyone wants to hear him play, and his concerts are sold out. He records albums, wins awards, and is feted by everyone he meets. Though he is a great success in the city, the bear could not help feeling, deep inside, that something is missing in his life. This beautiful book, with its gorgeous atmospheric artwork, takes a look at what can happen when you seek out fame and fortune. If you are a successful celebrity does this mean that you have everything you need to be happy? Or is there is something more precious than wealth, recognition, and success? Most of us experience days when we are upset, out of sorts, or grumpy. What does one do on such a day? A little self care is always a good place to start, and for me dipping into a book is often the perfect way to counter an unhappy mind and heart. Children experience blah days too and for them a book that is full of giggles and smiles is often just what they need. Packed with funny and wacky poems, today's poetry title is a perfect book to share with a child when he or she is having a hard day. Have you ever ordered a hot dog with everything on it? Perhaps you have and have experienced a hot dog loaded down with chili and onions and cheese and relish and…. Perhaps you even liked it. But, what would you have done if you ended up with a hot dog with literally everything on it? Everything including a parrot, a rake, a fiddle, and a front porch swing? Probably you would have refrained from making such an order again. In this wonderful collection of poems, there is a little bit of everything. There is the poem about the person who orders a hot dog with everything on it. Then we hear from a dentist who invented “trick or treat” so that children could fill their mouths with all kinds of sweet treats that would, ultimately, lead to them having to visit the dentist. Rather a clever trick don’t you think? Then there is the person who has a dreadful disease called lovetobutcants. This is an affliction that makes it impossible for the person to help put out the garbage can, carry a bag of groceries, cut grass and hedges, paint, wash dishes, and close doors. In fact the person cannot do anything that could be considered a chore. Though the person would “love to join the work,” the disease simply does not allow it. There is the kind of collection that readers can dip into at will. No matter where the reader begins there is always something on the page that will amuse and delight. Amusing stories, funny descriptions, and goofy characters fill this book, and the poems therefore serve as the perfect panacea for a case of the blues or blahs. I read and reviewed this book only yesterday and I am still thinking about it. When I first saw it I thought that it was just a counting book, but I was wrong. It is so much more. This book show us how a lonely tiger finds something in the world around him that first engages him and then gives him joy. He finds hope simply by watching, taking in, and finally connecting with the living creatures around him. The beauty and sheer joy found in much of the artwork makes me wish I could mount the pages of the book on my walls. Just like humans, animals can convey a great deal in their body language. The little twitch of an ear tells us that a dog that looks as if it is asleep is actually listening. The flick of a tail tells us that a cat is on alert, ready for whatever happens next. In this beautiful and thoughtful board book we meet a tiger; a “sad” tiger, sitting all by itself with its back to us. We can tell that it is sad and lonely just by its pose. Thankfully, when we see the tiger next it is “thoughtful” as it watches two bugs crawling on a leaf. Then it is “watchful” as it watches three colorful birds that are perched on a branch just above the tiger’s head. By the time we get to the number eight in this counting book our tiger friend is “smiling” in the company of eight buzzing bees. The tiger is stretched out, relaxed and with its eyes closed. There is smile on his whiskered face. This gorgeous counting book tells us the story of a tiger who slowly, by degrees, comes out of its shell to interact with the wonderful world around it. In the process, the tiger sees things that delight and intrigue it, and it also acquires something that is wonderful and precious. With its beautifully expressive art and its loveable tiger character, this charming little book will delight both children and adults. Sometimes the best way to appreciate what you have is to get away from your home for a while. I know this certainly is true for me. I often come home from a vacation and see my home and my life through fresh eyes. I see that I am rich in many ways.Today's picture book explores the idea that sometimes you have to adjust the way in which you see things before you can truly appreciate the world around you. Bear lives “at the top of the world” in a place that is covered with white ice and snow. Though there is beauty in his white homeland, Bear longs to see color, and gets very depressed because there is no color to be seen where he lives. When the little girl gets Bear’s thank you note, she decides that she needs to go to see him. Across the ocean she goes in a little boat and when she gets to the frozen, white north she tells the bear that she knows what he needs. She is going to take him on a trip. Together the little girl and the bear sail around the world and see many wondrous, and colorful, things, and the bear paints color-rich pictures of the things he sees. Each of his paintings are then placed in an envelope and they are sent off, via the seagull, to an unknown destination. All too often there are wonderful things in front of our eyes that we simply do not see because we don’t know how to. It would appear that there are ways of seeing that are not always accessible to us at first. This wonderful picture book explores a bear’s journey as he learns how to see, how to be open, and how to set aside discontent so that his eyes and heart are able to ‘see’ the world in a new way. Many people imagine that writing the text for a children's picture book story is easy. It isn't. Writing the text for a picture book story that is going to convey a 'message' is even harder. How does one share a message without being didactic or preachy? In today's picture book the author beautifully conveys a powerful message to her readers by giving us a storybook character who is engaging and lovable. Who can resist a giant who is essentially kind but who, like us, makes mistakes sometimes. We feel sorry for the giant and hope that he can fix the problems that he has created. We want to read on because we want the giant to have the happy ending that we feel he deserves. In the middle of a huge forest, on top of a crag, there is a cave, and in the cave there lives a giant. Every day the giant does what all giants do: he pulls up trees “as though they were weeds” and throws them, and he has a grand time “smashing and mashing” the mountains. Not surprisingly, the giant’s destructive activities begin to take a toll on the environment around him. The animals move away, and the forest gets “smaller and smaller” until all that is left are a few trees, no animals, and a lot of quiet. The “songs of the forest” have disappeared, and the giant realizes that his world is no longer the place that he loved. In the quiet he gets lonelier and lonelier. Then one day the giant see a little yellow bird and he is delighted when she sings to him. So happy is he that he catches the bird, puts her in a cage, and carries the cage up to his cave. The problem is that the bird does not like to be caged, and soon she is so sad that she does not sing at all. The giant knows that there is only one thing to do, and he frees the little bird, who flies away and disappears. The giant is alone once more. We like to think that the things we do only affect us, but the truth of the matter is that our actions often affect the people and the places around us. The giant in this story learns, the hard way, that his tree-throwing and mountain smashing activities come with a price. The question is, what is he going to do about it? With great skill the author of this book brings us a story that is simple and yet powerful. We see very clearly how a beautiful place can be changed when it is ill-used, and we see too how owning up to our mistakes can bring about change for the better. Writing a novel written in verse is a challenge most authors would think twice about taking on. The wonderful thing is that this writing form seems to be gaining popularity. I see more and more novels written in verse every year, which I think is wonderful. Sharon Creech is a master of this form and I am delighted to bring you my review of her latest book, Moo. On these pages you will meet a stubborn cow, a difficult old lady, and two children who somehow have to figure out how to get along with them both. One summer’s day Reena, her brother Luke and her parents are sitting in the family car stuck in a traffic jam. The noise, smells, and heat of the city throbs around them. Reena’s mother then asks her husband a question, one that ends up having huge consequences later. The question is, “do you still like reporting?” It turns out that Reena’s dad doesn’t really like his work anymore. Renna’s mother then suggests that they should “get out of here,” and when her husband asks where they should move to, Reena is the one who says that they should move to Maine. To everyone’s surprise that is exactly what they do. They sell up, pack up, and drive north, and soon enough they are living in a small coastal town where Reena and Luke can safely ride their bikes everywhere. They ride past a farm and watch as groups of teenagers work with the animals, taking care of them as needed. Including the cows. The cows that are so big and intimidating. Reena’s mother gets to know an elderly and rather eccentric lady called Mrs. Falala and she asks her children to take her some books. Neither Reena or Luke want to go because the old lady scares them, but they do as they are told. The visit does not go well. Mrs. Falala upsets Luke, Reena comes to his defense, and both the children are told to leave. As a result of this unfortunate encounter, Reena and Luke are volunteered (against their will) to help Mrs. Falala “for a while.” What does that even mean? Reena is almost afraid to ask. The first task the children are given is to shovel up piles and piles of cow manure. To say that it is a disagreeable job is an understatement. It is horrible, and Mrs. Falala does not thank the children for their help. Instead, she tells them “Tomorrow: cow.” What does that mean? Then there is the fact that they know “ZERO about cows.” The children’s parents think that this is a perfect opportunity for Luke and Reena to learn about cows. Of course they do. Reena and Luke’s official first encounter with Zora shows the children that Zora is not a friendly beast. Or a nice one. Or a compliant one. She is an ornery animal who refuses to cooperate when Reena goes to bring her to the barn. Zora dodges the rope Reena tries to throw over the cow’s head, chases the children, and even head-butts Reena. When Mrs. Falala says that the children are “babies,” Luke loses his temper, takes the rope, and neatly drops it over the cow’s head. Then Renna is told to bring the cow into the stall. This does not go so well. Roping and bringing Zora into the stall is bad enough, but the next day Mrs. Falala says that she is expecting the children to show Zora at the fair. Surely this is a joke. Reena and Luke know nothing about showing cows at fairs. They have never even been to an agricultural fair. With each day that they spend at Mrs. Falala’s place, the children learn something new about cows, and farms, about Mrs. Falala, and about themselves. They never imagine that their interactions with the crabby old lady and the difficult cow will end up making their lives richer. Written using a combination of blank verse and prose, this wonderful book explores the ways in which the lives of two children change when they move away from the city and discover country living, and cows, for the first time. It is fascinating to see how the children’s attitudes change as they get to appreciate their new home, and how having new people and animals in their lives helps them to grow. I have a confessions to make. I have a soft spot for mole characters in children's literature. 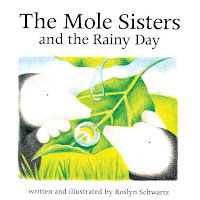 I was therefore naturally drawn to the stories about the Mole Sisters. Once I started reading these books I came to appreciate that these sweet stories about two very delightful mole characters have much to offer readers. Each of the books in the Mole Sisters series offers up a little gentle wisdom. Today's title reminds us that we must not give up hope during dark days. We must seek solutions and remember that dark days are always followed by sunny ones. It is “lovely day” and the mole sisters are taking a walk. Unfortunately, their pretty sunny day turns into a very rainy day. 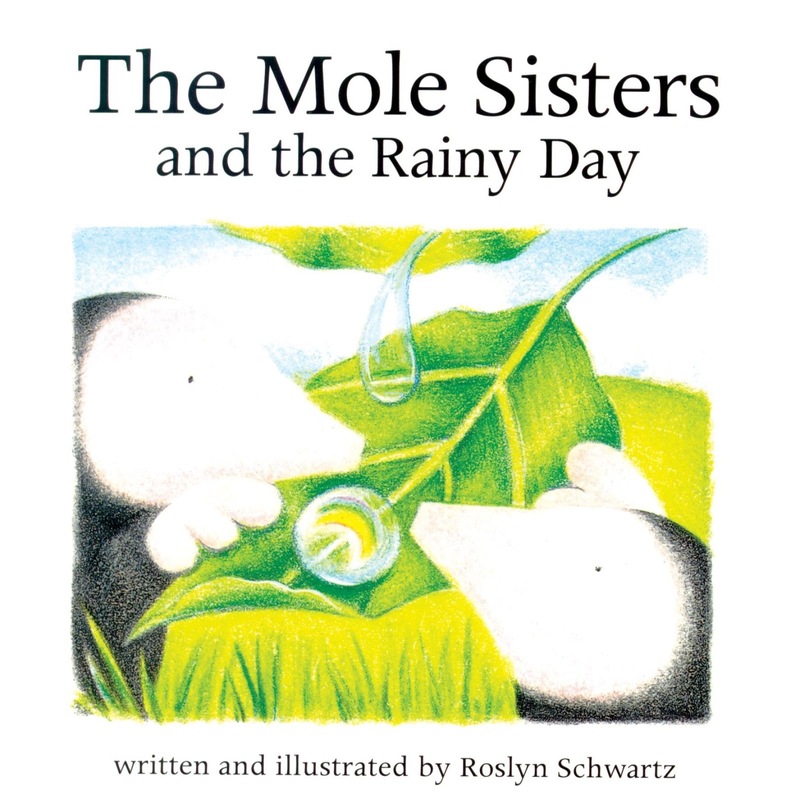 The mole sisters are quite sure that the rain “won’t last” but is does. In fact, it comes pouring in sheets and the two little furry creatures have to make a run for home. At least at home they can be out of the rain. Or perhaps not. The mole sisters have a leaking roof. Now what are they to do? Once again the mole sisters find a wonderfully creative way of dealing with a problem. They also never give up hope that their situation will improve, and that is exactly what happens. Delightfully soft illustrations and a simple little story will charm young readers and remind them that even the most fierce of storms will pass. All you have to do is make the best of things and wait for the sun to come out again. Over the years I have been able to add reviews of many wonderful books to my Black History Month Feature. Many of these books tells the stories of brave and steadfast African-Americans who made the world a better place even though the odds were so strongly against them. Today a bring you a book that is a little different. It is about two little Caucasian children who know nothing about racism when we first meet them, and who later see the ugliness of bigotry first hand. When we look through the eyes of innocent children we truly see how cruel and unacceptable racism is on so many levels. Abbey Finch recently went to the big city with her mama to go shopping, and while she was there she saw a water bubbler that had a sign hanging over it that said “Colored.” She tells the kids back at home about what she saw and they all think she is “crazy.” Why would anyone have colored water coming out of a water fountain? The kids are inclined to think that this story is yet another of Abbey’s fibs, but they cannot help thinking how wonderful it would be to see a fountain that spouts forth colored water. Lulu and her cousin Jelly decide that they really have to see this marvel, and by some miracle they soon get the opportunity. Uncle Jack needs to get a part for a tractor he is working on, and the two children pester the man to take them with him until he gives in. Of course, Lulu and Jelly know better than to tell Uncle Jack why they really want to go to the big city so badly. Now, Lulu and Jelly have never been to the big city before, and the sight of all those tall buildings, the streets, and the lack of fields and trees is rather overwhelming. Uncle Jack finally gets to his destination, a shop across the street from city hall, and he goes to get the tractor part that he is looking for, telling the children to “Stay put” while he is gone. Of course they don’t. The colored water bubbler is right there and so they go and investigate, never expecting that what they will experience on that hill next to the city hall will put a crack in their world view that will change them forever. Children are naturally open and accepting of everyone. Until someone teaches them to be fearful of people who are different from them, they more often than not do not really see or care about another child’s skin color, hair color, eye color, or eye shape. For them a kid is just a kid. In this thought-provoking book Matt Faulkner gives young readers a story about two children who have no idea that a whole section of their society, African-Americans, are forced to live separately, and are denied rights that white people take for granted. In just a few minutes the children discover that in the adult world there are lines and boundaries that cause anger, pain, and frustration. Seeing the world through Jelly and Lulu’s eyes will remind adults of that time when they, like these two children, were free of prejudice. The story will give those adults the means to have an open dialogue with the children in their lives about racism. Not long ago we brought a new kitten into the household. The kitten, Legolas, did not like our resident dogs, Pippin and Pinot, at all. The dogs were fascinated by the kitten and wanted so badly to sniff him and play with him, but Legolas spat and hissed whenever Pippin and Pinot were near. The dogs simply could not understand this. 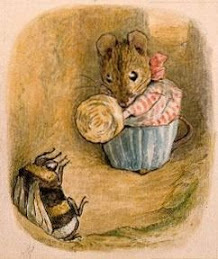 Why didn't the little animal want to be friends? Today's poetry title contains a deliciously funny story about a cat whose family acquires a puppy, much to the cat's disgust and annoyance. The story is told using haiku and it was a joy to read. Won Ton has a wonderful life. Every day is the same, which is how he likes things to be. Wonton naps, he plays, he has a bath, he naps again, he eats, and then the process is repeated. This is the “purrfect” life for a cat. Then one day Won Ton is woken up by a noise and he decides to snoop. He discovers that there are toys on the floor that do not have feathers or fur on them, toys that are therefore not suitable for a cat. Who do they belong to? Won Ton snoops some more and what he sees is enough to give any self-respecting cat a heart attack: There is a puppy in the house. Won Ton has a cat fit and ends up being put outside, which is very galling. The dog is the one who should be thrown out. Won Ton wastes no time making sure that the puppy knows that he, Wonton, is the boss in the house. The rules are laid down and when the dog eats Won Ton’s dinner he is given a paw smack. To Won Ton’s horror he ends up being put outside. Again. As he lies under a chair in the yard Won Ton misses Boy and wonders if their wonderful relationship will ever recover. In this wonderful poetry picture book, delightfully expressive haiku are paired with amusing artwork to take readers into the world of a cat who does not like having to share his home and his people with a dog. Children will sympathize with Won Ton and will hope that the cat will be able to make his peace with the puppy. Is there hope for Won Ton and the canine pest? There are some authors whose stories lift me up. Their tales always give me something to think about, and I always have a better perspective on life after I have finished reading one of their titles. Patricia MacLachlan is one of these authors. Today my Books of Hope title is a celebration of family, and to say that it is an uplifting story is an understatement. After I read this book I felt as if the world had become brighter and more promising. I was reminded of the fact that being able to love and care for others is a privilege. Every year Lucy and her family drive to North Dakota to spend part of the summer with Aunt Frankie. This year in particular Lucy’s father, Boots, feels that they need to be there because the rainy season has been very wet, which means that the river will be well over its banks. Aunt Frankie will need help safeguarding her home and her possessions from the water. Almost everyone in Lucy’s family has something that they do well. Boots is a poet, though he set aside his pen when he decided that he loved caring for cows more than he cared to write down words. Lucy’s sister Gracie is a wonderful artist and she sings well too. Lucy herself cannot sing at all but she loves to write poetry and hopes to become a poet one day. What no one, other than Lucy knows is that little two-year-old Teddy is a superb singer. Everyone knows that Teddy does not care to speak, but they don’t know is that Teddy can carry a perfect tune. Every night Teddy comes to Lucy’s room and he sings a wordless song for her. This time together is their precious secret, and it has strengthened the already strong bond that they share. Two things happen on their trip as they make their way across the open country. Teddy says his first word, which is, not surprisingly, “cow.” Then it starts to rain. Heavily. Aunt Frankie tells Boots to turn around the go home, but they all agree that they should keep going because Aunt Frankie is going to need them, even if she thinks that she isn’t. Sure enough, in the middle of their first night at Aunt Frankie’s house, it starts to rain again and the water level rises. Lucy, Boots, Auntie Frankie and other folk work hard to move Aunt Frankie’s store of grain to higher ground, and they put sandbags in front of the porch, though everyone knows that that water is going to probably go right over them. In the morning the porch steps are gone and the “Water sits even with the porch floor.” The good news is that the rain has stopped. It looks as if the worst is past, but another danger lies ahead that none of them could have predicted. In this incredibly rich and powerful story, Patricia MacLachlan explores the incredible bonds that connect members of a family. When Aunt Frankie needs them, Lucy and her family (and their chickens) drive for hundreds of miles to help out. When Teddy needs to be comforted, Lucy, who cannot sing, finds a way to sing anyway. When Lucy’s mother needs to reassured that she is loved and needed, Teddy, the boy who does not speak, speaks. With a narrative that is touched with humor and poignancy, this beautifully written story will touch readers of all ages.